A variation of the Glacier, this model features six distinctive five-pointed stars that are reminiscent of designs out of the old west. As with the Glacier, the design accents and legs may be stained in a contrasting color. 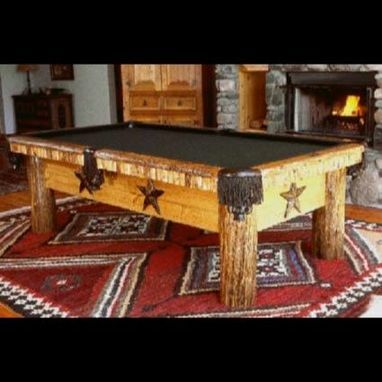 This pool table also includes "star" sights in the rails, fashioned from a dark cocobola wood, to add to the over-all western look. Dimensions: Billiard Tables come in 7', 8', Pro-8 and 9' lengths. Go to our website for more information.